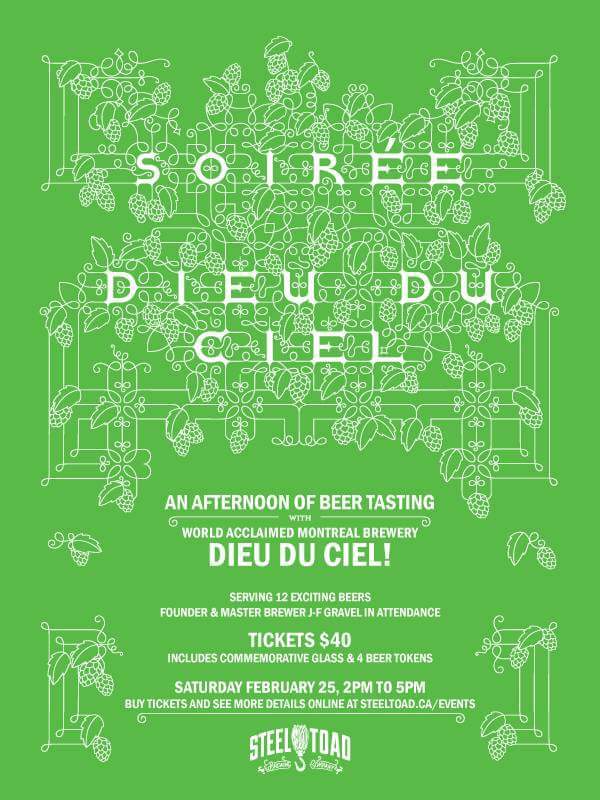 Dieu Du Ciel is a highly celebrated Quebec brewery as we all know in BC but now we will have a chance to try a bunch of rare beers here in Vancouver. The event takes place on September 25th 2017 between 2pm and 5pm. The event is being held at Steel Toad Brewpub in the Brewery Creek neighborhood of Vancouver. Tickets are $40 and include a commemorative glass and 4 beer tokens. Extra tokens can be purchased at the event. The founder and master brewer will be on hand to meet and discuss the beer. They will be bringing 12 plus beer that have never been available in BC before. Cheers for Untapped, Steel Toad Brewpub and Dieu Du Ciel for putting on this event. I hope to see you there. This entry was posted in Tasting Event and tagged bc, canada, craft beer, dieu du ciel, montreal, quebec, steel toad brewpub, tasting event, vancouver.